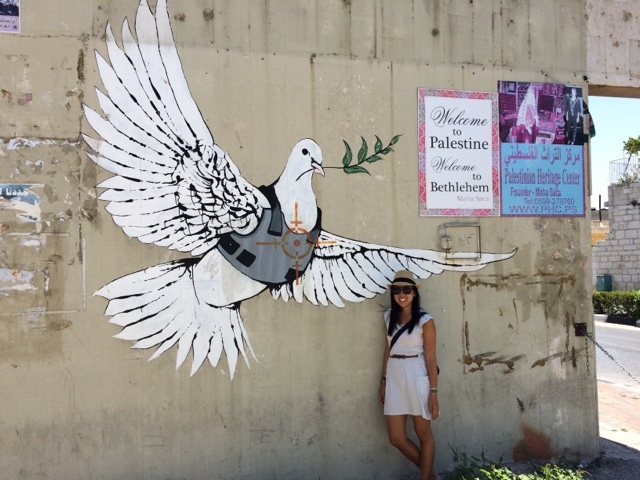 I'm in Bethlehem, the place that's in all the Christmas songs! Honestly, that was my first thought when we headed there this morning. Oh, and maybe Jesus was born there too. Took a bus to Bethlehem from Jerusalem, which is actually incredibly close (like 10 min away) - however, Bethelem is in the West Bank - which means the bus takes a very circuitous route and it was closer to 45 min. It's actually crazy because this means there are checkpoints between the cities and residents of Bethlehem are not allowed into Jerusalem. It also means we had to bring our passports on the bus, because upon re-entry into Jerusalem, Israeli soldiers (who all carry big guns, btw) stop all the buses and check the nationality/citizenship of everyone on the bus. More on this later. The best part was we got a guide to show us through the church, and the line to visit the birthplace of Jesus was super, super long. Not a problem for our guide - he wound us through to the exit, talked to the security guard (they seemed to know each other), and then let us cut through the exit of the birthplace, thereby cutting the entire line and ensuring that he was more than worth the entire price we paid him in that exact moment. He even shooed people away so we could take all the photos we wanted. You have no idea how rare it is for the below photos to be without people - the room was mobbed when we first entered. He made sure they all got out of the way for our photo. Holy amazing. 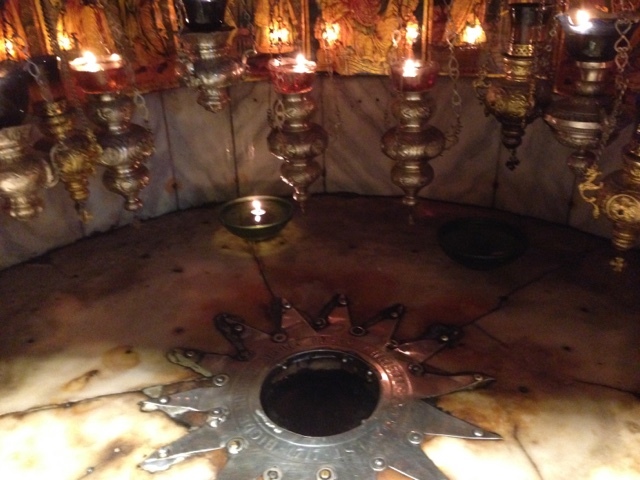 This is the manger where Jesus was born! After our tour, our tour guide hooked us up with a store owner, who hooked us up with a cab driver that drove us around Bethelem looking at the Banksy graffiti in the city. 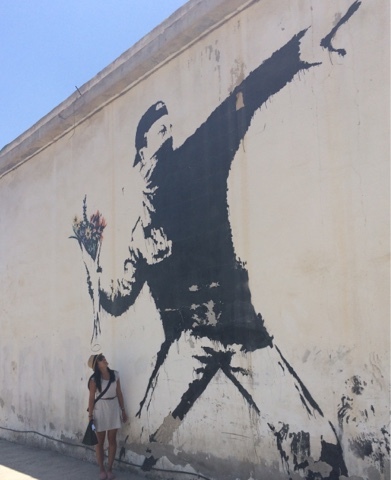 I know you are all super-happening, but just in case for those who don't know, Banksy is a famous British graffiti artist (probably the most famous) whose identity remains unknown (how is this still possible?). He often does graffiti that is provocative, or has underlying social/political messages. 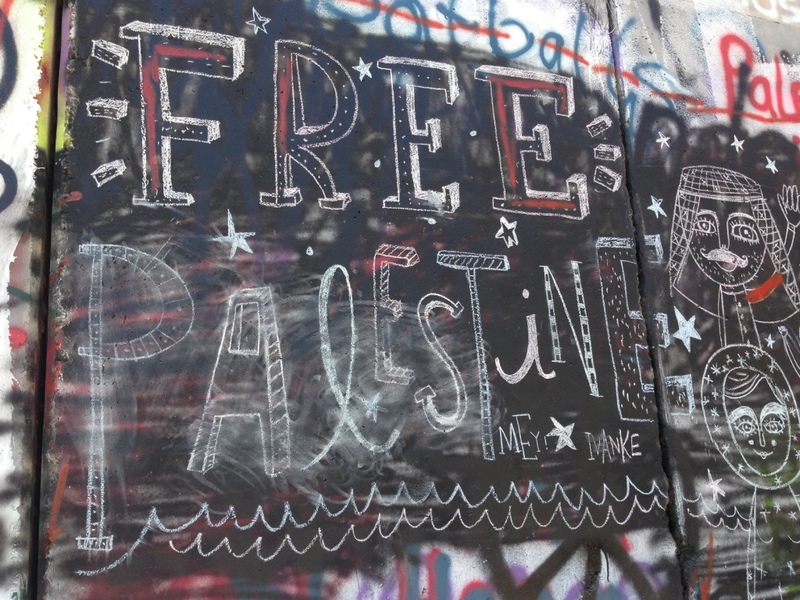 Of course, the point of all the graffiti, and the message underneath, was all due to this wall. It's the Israeli-West Bank barrier. The wall is huge - it's 25 feet high and fences off the entire West Bank from Israel, and doesn't allow free passage for the Palestinians to enter the rest of Israel. 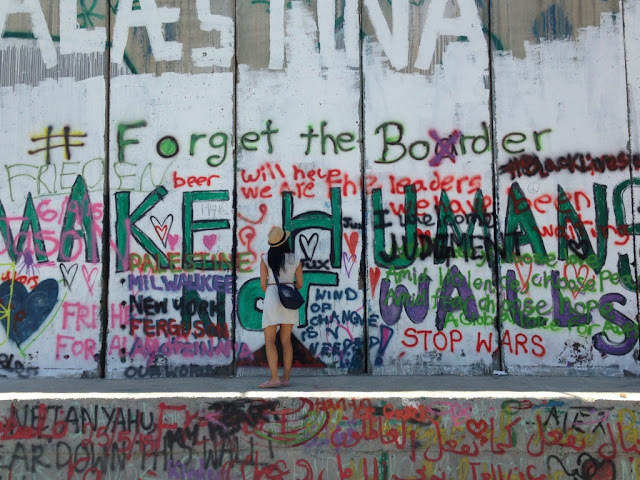 The crazy thing, to me, is that this wall was built so recently - it started being constructed in 2001/2002, with the Israeli government citing the purpose as an anti-terrorist measure. Despite the fact that the U.N. has declared it illegal, it still exists. 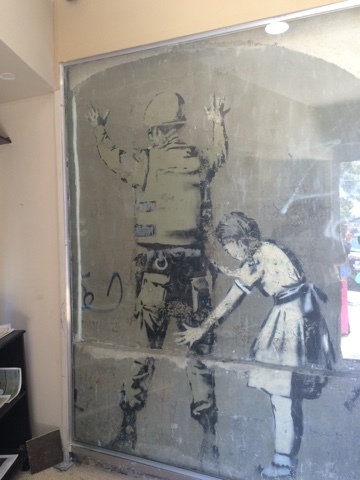 It's obviously very controversial, which is why Banksy's graffiti is there. 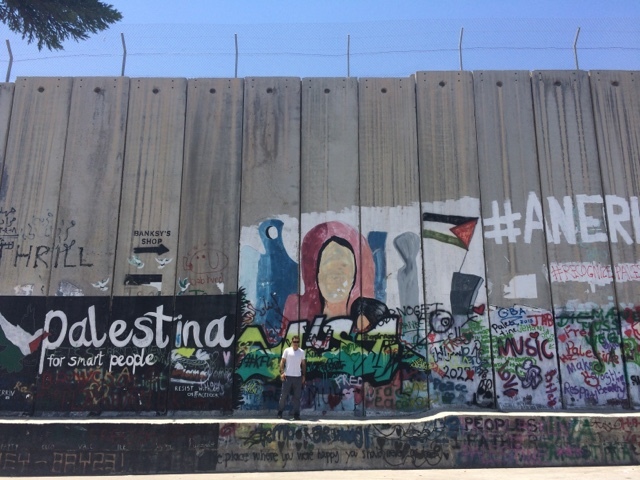 Our taxi driver's feelings (and I think this may be a good implication for the feelings of a good number of residents in the West Bank) were that Israel took advantage of the terrorist attacks in 2001, when the world's attention was focused elsewhere, to build this wall. I think the part I identify with most is just the human impact of situations like this - you just see so many lives affected, and it's an overall, incredibly sad situation. On that same note, on the bus back to Jerusalem - Israeli troops got on the bus to check passports and I almost had a heart attack because Drew had accidentally forgotten his at the hotel. After some questioning, though - they let him by with a stern "Make sure you bring it next time." I don't think Drew could pass for anything but American, which probably helps. After we had finished our tour of the Nativity Church, we ended up at this wood store that makes things out of the wood from olive trees. We ended up chatting with the owner, who was this lovely man who was born in Bethlehem, but had spent the past 25 years in New Zealand. However, he had just moved back to Bethlehem to take over his father's wood shop. I asked (what I thought was) an innocent question about how he liked being back in Bethlehem. He said it was nice being back with his people, but he commented that he felt like a prisoner because he can't leave the city to go anywhere else. Even with his New Zealand passport, he's not allowed past the wall or into Israel because his birthplace always says Bethlehem. And since the West Bank is not a country or city-state or anything really recognizable for other nations, there are no diplomatic relations with other countries. In fact, there are only about 4 countries that allow him to enter without a visa (which he described as a long, harrowing, near-impossible prospect). He pointed out that at the end of the day, our simple act of getting back on the bus to go back to Jerusalem - he couldn't do. Honestly, he wasn't even saying in a woe-is-me kind of way or anything, a lot of it was very matter-of-fact and only because we were asking more questions. But it just made me sad. It was my moment of the day just because it was incredibly powerful to me - that this guy felt trapped inside his own city. I know the situation is a long, storied, complicated one and that there are many sides and facets to it - but in this moment, I felt for him. Olive trees can lives to be 7,000 years old. Says our olive-tree-wood-making owner friend. 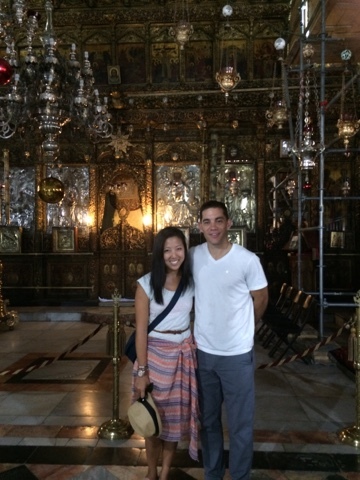 There are seriously churches dedicated to everything in Bethlehem. 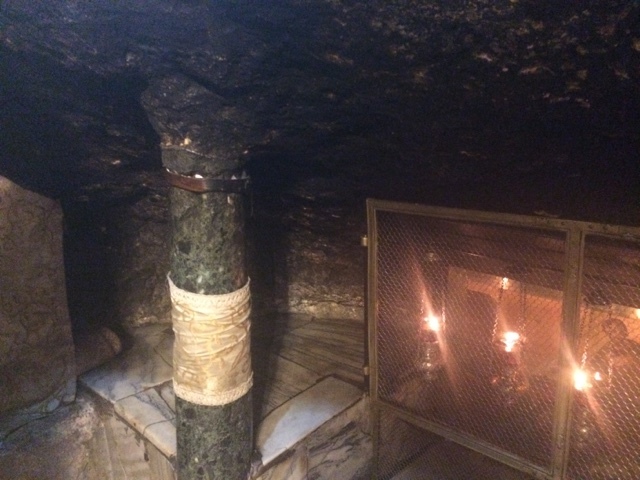 There's even a Church of the Milky Grotto, where Jesus was apparently nursed. I love you and your commentary and your heart and mind and soul and xoxo I'm waxing Mr. Darcyish so either I need to meet you up or you need to come home to me!! How was your trip!?!? It looked amazing! Now let's go adventure together!! Love you xo! Ugh. So sad. So fucked up. It's like they are refugees in their own home. This reminds me of a line from Empire Records: "Damn the man. Save the Empire." Jerusalem, Israel: The Holy Land!